Successfully Added 7.2mm CNC Metal Dual Glass Siswoo C5 Blade - Android 6.0, 2GB RAM, 5 Inch HD Display, 2000mAh, Dual-Band WiFi, 4G, 2 IMEI to your Shopping Cart. 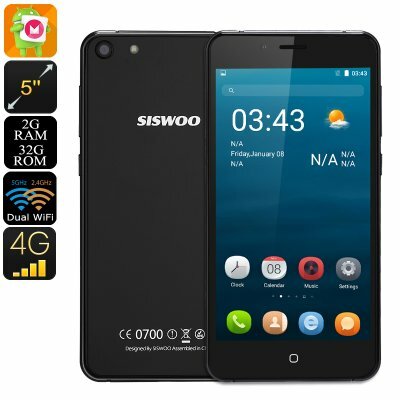 The Siswoo C5 Blade is a sleek Android phone that brings forth a powerful performance. Despite its low price tag, this cheap Android phone is capable of handling the latest software applications. With its Android 6.0 operating system, it lets you enjoy all the familiar Android features, games, and more. By packing a Quad-Core processor and 2GB RAM, the Android phone is sure to handle all the basic Android features without dropping a frame. Whether you’re into movies, games, or wish to browse the web – the Siswoo C5 Blade supports it all. The 32GB of internal storage can be upgraded with an additional 32GB memory through its SD card slot. Therefore, your Android smartphone holds plenty of space for you to keep all your media and files. What really sets this smartphone apart from the other cheap Android phones is its connectivity. With its 2 IMEI numbers, it brings along great connectivity wherever you go. From now on, you’ll always be able to stay within touch your friends and family at home no matter where you’re at. Additionally, your Android phone also treats you to 4G and Dual-Band WiFi. Thanks to this, your cell phone lets you browse the web at lightning speeds at any given moment. Whether you’re at home, hiking outside, or enjoying a holiday abroad – with this Android smartphone you’ll always stay connected. On its 5 Inch HD display, you will be able to enjoy all your favorite media in crisp 720p resolution. By supporting the latest IPS technology, it lets you enjoy detailed images no matter your viewing angle. Play Store access allows you to download the latest media file available. Therefore, you’ll never have to be bored again with this Android phone in your pocket. Thanks to its massive 2000mAh battery, you’ll be able to use all its features for up to 6 hours in a row. From now on, you’ll be able to use your phone throughout the most demanding of days without needing to fear about running out of juice.